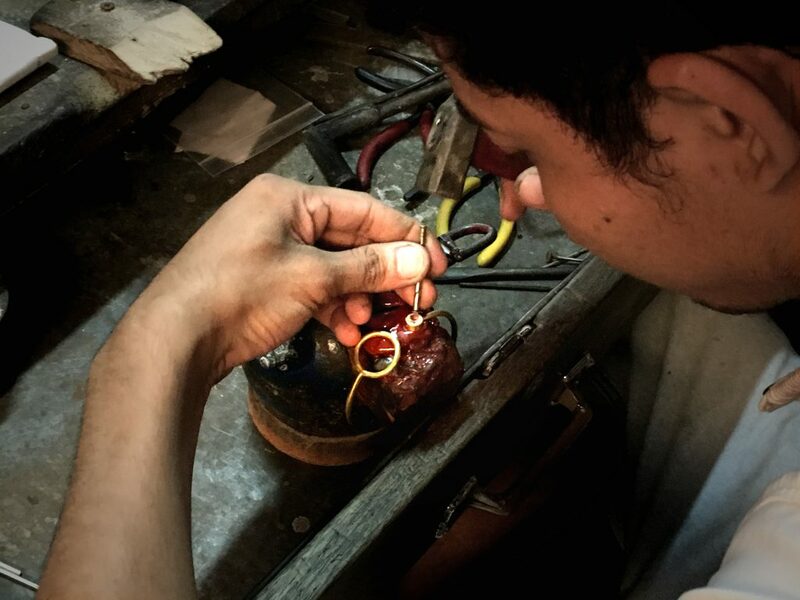 Deep in the hot dim maze of the Russian Market in Phnom Penh, you can find various jewellers’ shops. Our gemstone dealer’s tiny shop is an oasis of light, air conditioning and sparkling gemstones in glass cabinets. 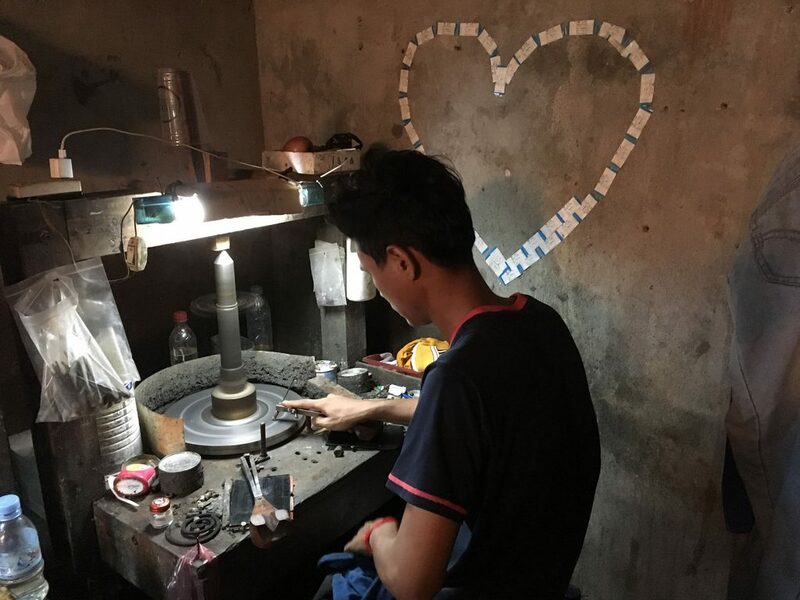 He comes from a family who have been in the gemstone mining and lapidary business for generations. 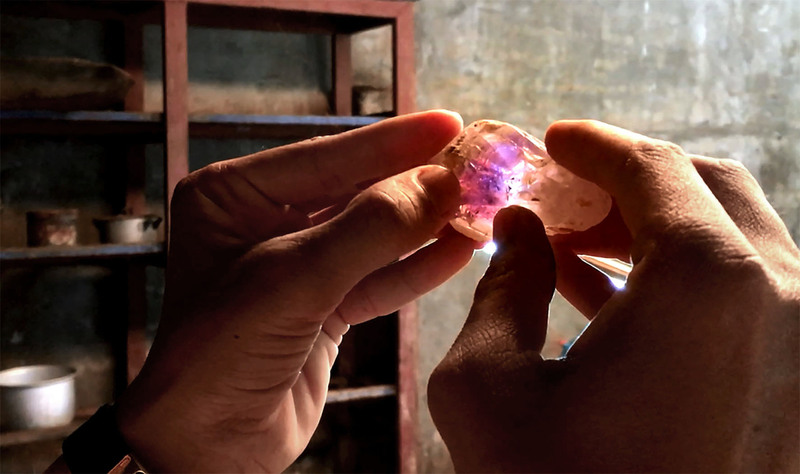 Although more famous for its recent dark history, Cambodia is in fact known historically for its gemstone deposits such as amethyst, ruby, sapphire, zircons, aquamarines and topaz. 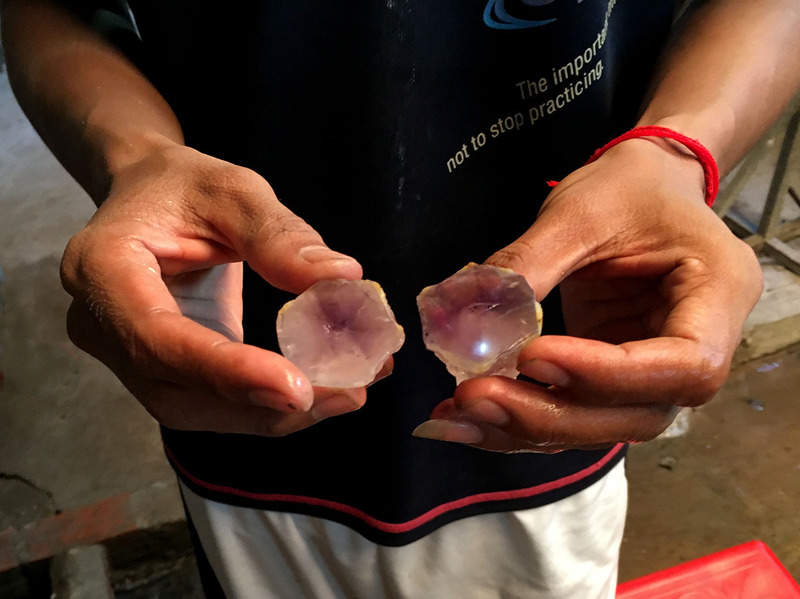 All our gemstones are locally sourced in Cambodia. 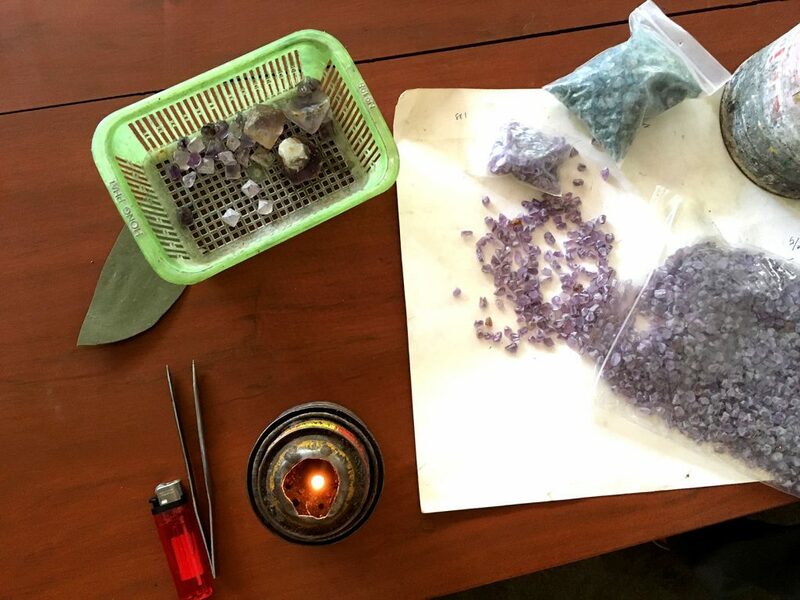 Amethyst is a purple variety of the mineral quartz and its most valuable variety. Amethyst occurs in primary hues from a light pinkish violet to a deep purple. Ours come from Ratanakiri province near the Laos border. Aquamarine is a type of beryl named after the sea, as it has lovely watery aqua hues ranging from almost white to deep blue aqua. Aquamarine is a dichroic gemstone and may appear almost colorless when viewed from one angle and show aqua blue tones when viewed from another angle. 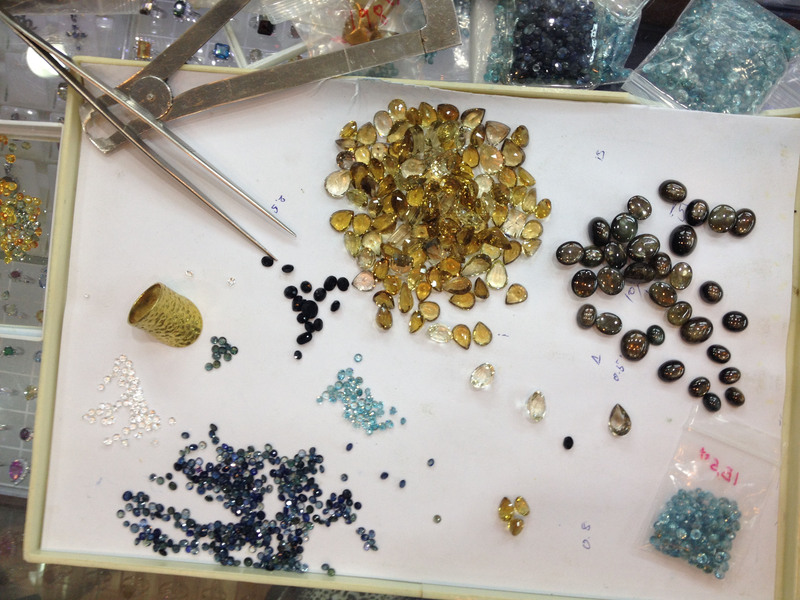 Our aquamarine comes from Takeo province. Pure topaz is a rare silicate mineral. It is generally colorless and transparent but is usually tinted by impurities, so it can come in a variety of colours, but these are rare unless treated. It is prismatic, so that you can see different colours depending on the light. Topaz is very hard, with only diamond being a harder gemstone. It is occasionally found in large boulder sizes. Our Topaz comes from Takeo. Onyx is formed of bands of chalcedony in alternating colors. It is cryptocrystalline, consisting of fine intergrowths of the silica minerals quartz and morganite. Black onyx is the most common variety but not as common as onyx with banded colours. Sapphire is a variety of the mineral corundum, an aluminium oxide. It is the third hardest gemstone after diamond and topaz. Although blue is the best-known sapphire color, they occur in other colors, including gray and black, and they can be colorless. 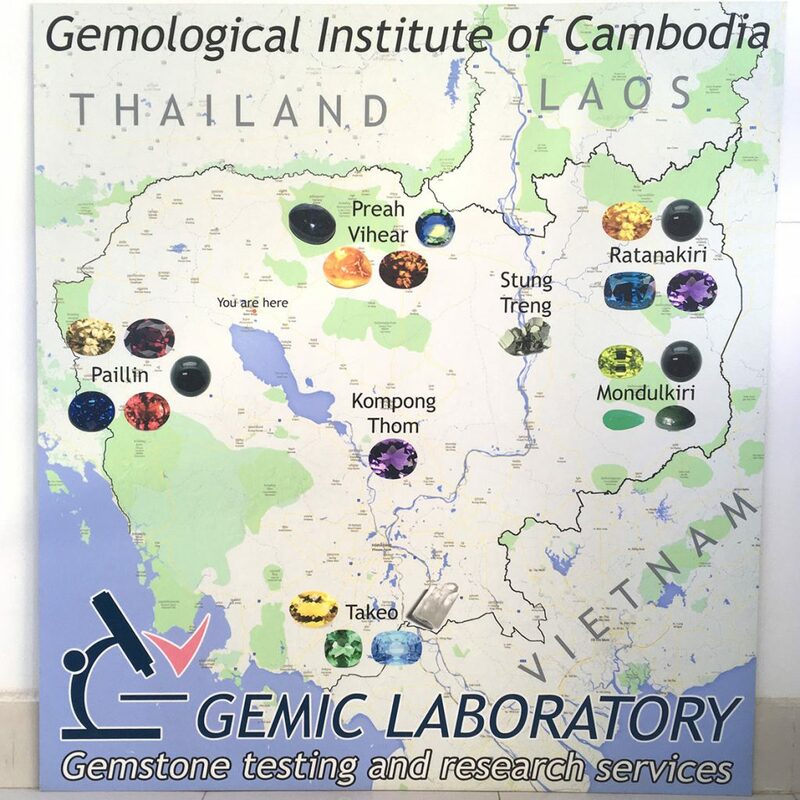 Our natural sapphires are from the famous mines in Pailin and from Preah Vihar province. They are a unique smoky dark blue, and their hue varies from stone to stone.